KURT LANGMANN PHOTO Little Jada turned on the lights of the Aldergrove Christmas tree at the Light Up Aldergrove Christmas Parade After Party. She also was presented with a brand new bicycle from Cranky’s Bikes and Aldergrove Business Association as her prize for her entry in the Light Up Aldergrove Christmas colouring contest. WATCH: Three dozen were in attendance at the Aldergrove Legion’s annual Christmas breakfast, designed to unite Legion members and their families for a little holiday time together. 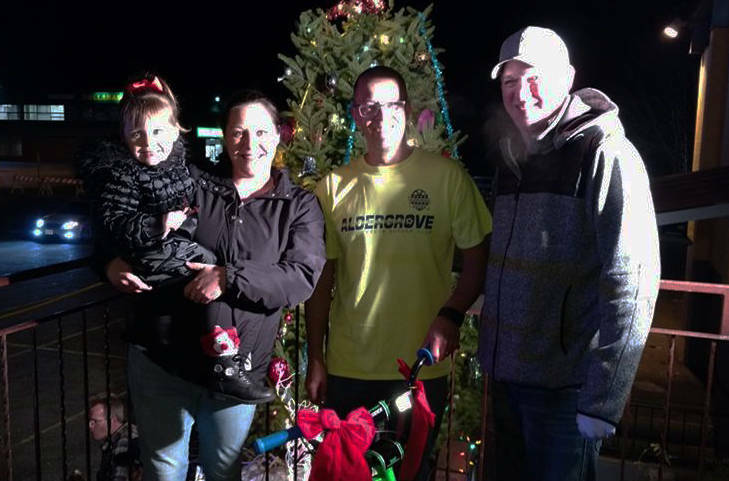 Little Jada turned on the lights of the Aldergrove Christmas tree at the Light Up Aldergrove Christmas Parade After Party. She also was presented with a brand new bicycle from Cranky’s Bikes and Aldergrove Business Association as her prize for her entry in the Light Up Aldergrove Christmas colouring contest.